With the cost of almost everything increasing daily, the impetus to save money wherever possible gets stronger. Economising and becoming more environmentally aware can save money, even if it costs a bit in the beginning. We’re going to discuss how hiring our plumbers in London can actually save money in the longer term. Becoming more efficient isn’t a bad thing, it’s something we would have had to have done anyway, it would just have been nice to do it at our own speed. We aren’t usually happy with having our hands forced into something, but here we are. The more efficient you can make your home, the less you will have to pay out in utility bills. The idea that paying for a professional to visit your home will in the end save money is a little at odds with logic to begin with, but bear with us. You would think the hourly rate of the average plumbers in London would pay for a month’s worth of energy, but over the longer term it does actually save money. First off is maintenance. 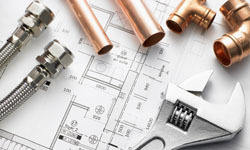 Fixing leaking taps, faulty joints, servicing your boiler, ensuring all pipes are insulated and that waste pipes flow cleanly are just some of the minor maintenance tasks that our plumber can do that will save money. Stopping leaks and ensuring your boiler runs efficiently are the two jobs that will pay for themselves over time. That’s especially true if you’re on a water meter, as the more you use, the more you pay. An efficient water heater not only saves money on water, but on gas or electricity too. With the recent news that energy prices are rising yet again, this job is a no-brainer. Another way plumbers in London can save you money is by fitting so-called “green” plumbing fixtures. These come in a variety of forms, from the inflatable bag that sits inside your cistern, to water-saving taps that use less water but provide the same pressure. There are also composting toilets for those with the land to handle the waste, dual-flush toilets or even waterless urinals. There are also efficient shower heads that can maintain a comfortable pressure while using less water. This will still give a great shower but will use almost half the water. It’s difficult to proof yourself for the future because time and technology moves so quickly. However, using solar water heating technology is cutting-edge, and something that is likely to be with us for a long time. It’s also something many plumbers in London are qualified to provide. Using the power of the sun to heat water is a low-maintenance way of providing the water your family needs at a fraction of the price. The downside is the initial cost of the installation. These are just some of the ways hiring a plumber from My London Builders can actually save you money. We hope that now you understand the logic behind our thinking and consider some or all of these services for your home.